In the fed state (see Figure 5.6), when there is an ample supply of metabolic fuels from the gut, the main processes occurring are synthesis of reserves of triacylglycerol and glycogen; glucose is in plentiful supply and is the main fuel for most tissues. By contrast, in the fasting state (see Figure 5.7) the reserves of triacylglycerol and glycogen are mobilized for use, and glucose, which is now scarce, must be spared for use by the brain and red blood cells. As discussed in section 5.3, the principal hormones involved are insulin in the fed state and glucagon in the fasting state. Adrenaline and noradrenaline share many of the actions of glucagon, and act to provide an increased supply of metabolic fuels from triacylglycerol and glycogen reserves in response to fear or fright, regardless of whether or not fuels are being absorbed from the gut. In liver and muscle, insulin and glucagon act to regulate the synthesis and breakdown of glycogen, as shown in Figure 10.6. They also regulate glycolysis (stimulated by insulin and inhibited by glucagon) and gluconeogenesis (inhibited by insulin and stimulated by glucagon). 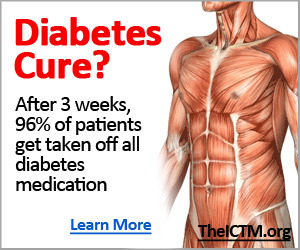 The result of this is that in the fed state the liver takes up and utilizes glucose, to form either glycogen or triacylglycerols, which are exported to other tissues in VLDL. By contrast, in the fasting state the liver exports glucose formed from the breakdown of both glycogen and gluconeogenesis. As discussed in section 5.5.3, in the fasting state the liver also oxidizes fatty acids and exports ketone bodies for use by other tissues. 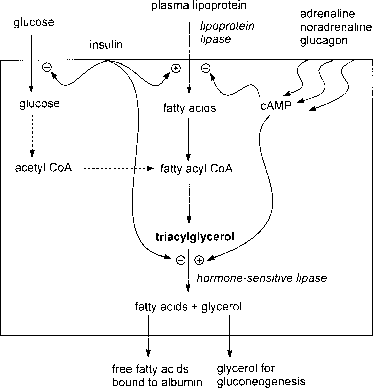 Figure 10.11 Hormonal control of the synthesis and hydrolysis of triacylglycerol in adipose tissue. these vesicles to the cell surface, where they fuse with the cell membrane, exposing glucose transporters. This results in an increased rate of glucose uptake, and hence increased glycolysis (section 5.4.1) and increased availability of acetyl CoA for fatty acid synthesis (section 5.6.1). In the fasting state, when insulin secretion is low, little or no glucose is taken up into adipose tissue cells. Activation of lipoprotein lipase at the cell surface. As shown in Table 9.2, lipoprotein lipase has a very short half-life, of the order of 1 hour. In response to insulin acting on adipocytes there is induction of enzyme synthesis. The newly synthesized enzyme then migrates to the surface of the blood vessel endothelial walls, where it binds chylomicrons or VLDL (section 5.6.2) and catalyses the hydrolysis of triacylglycerol. The non-esterified fatty acids are mainly taken up by adipose tissue and used for synthesis of triacylglycerol. Inhibition of intracellular lipase (hormone-sensitive lipase). This reduces the hydrolysis of triacylglycerol reserves and the release of non-esterified fatty acids into the bloodstream. Activation of intracellular hormone-sensitive lipase. This catalyses the hydrolysis of the triacylglycerol stored in adipose tissue cells, leading to release into the bloodstream of free fatty acids (which are transported bound to albumin) and glycerol, which is an important substrate for gluconeogenesis in the liver. 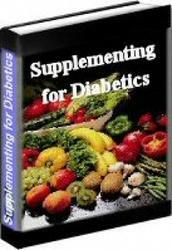 There is a continuous release of non-esterified fatty acids from adipose tissue. In the fed state most of the fatty acids are taken up by the liver, re-esterified to form triacylglycerol and exported in VLDL (section 5.6.2.2). This apparently futile (and ATP-expensive) cycling between lipolysis in adipose tissue and re-esterification in the liver permits increased utilization of fatty acids as fuel in muscle by increasing the rate of fatty acid uptake into muscle without the need to increase the rate of lipolysis. As discussed in section 10.6, the extent to which muscle utilizes fatty acids is determined to a considerable extent by the intensity of physical activity, rather than by their availability. The liver synthesizes fatty acids in the fed state, and oxidizes them in the fasting state. The direction of metabolic flux (lipogenesis or lipolysis) is controlled both in response to insulin and glucagon and also by intracellular concentrations of substrates. CoA, and hence increased formation of citrate, which is exported to the cytosol for fatty acid synthesis (see Figure 5.27 and section 5.6.1). Insulin also stimulates the activity of acetyl CoA carboxylase, leading to increased formation of malonyl CoA for fatty acid synthesis (see Figure 5.27). In the fasting state, glucagon has the opposite actions, decreasing glycolysis (and so reducing the availability of pyruvate, acetyl CoA and hence citrate for fatty acid synthesis), increasing gluconeogenesis and decreasing the activity of acetyl CoA carboxylase. Pyruvate dehydrogenase is inhibited in response to increased acetyl CoA, and also an increase in the NADH/NAD+ ratio in the mitochondrion. The concentration of acetyl CoA will be high when ^-oxidation of fatty acids is occurring, and there is no need to utilize pyruvate as a metabolic fuel. Similarly, the NADH/NAD+ ratio will be high when there is an adequate amount of metabolic fuel being oxidized in the mitochondrion, so that again pyruvate is not required as a source of acetyl CoA. Under these conditions pyruvate will mainly be carboxylated to oxaloacetate for gluconeogenesis (section 5.7). The regulation of pyruvate dehydrogenase is the result of phosphorylation of the enzyme (see Figure 10.5). Pyruvate dehydrogenase kinase is allosterically activated by acetyl CoA and NADH, and catalyses the phosphorylation of pyruvate dehydrogenase to an inactive form. Pyruvate dehydrogenase phosphatase acts constantly to dephosphorylate the inactive enzyme, so restoring its activity and maintaining sensitivity to changes in the concentrations of acetyl CoA and NADH. As discussed in section 5.6.1, citrate leaves the mitochondria to act as a source of acetyl CoA for fatty acid synthesis only when there is an adequate amount to maintain citric acid cycle activity. As citrate accumulates in the cytosol, it acts as a feed-forward activator of acetyl CoA carboxylase, increasing the formation of malonyl CoA. Fatty acyl CoA in the cytosol implies a high rate of fatty acid uptake from the bloodstream; fatty acyl CoA inhibits acetyl CoA carboxylase and so reduces the rate of malonyl CoA synthesis and fatty acid synthesis. What hormone is elevated during the fed state? Which hormones control liver metabolism during feeding, early fasting state, or late fasting state? How do events in gluconeogenesis relate to the fed and unfed state in human nutrition? How hormones regulate our blood glucose levels in both the fed and fasting states? Which blood glucose regulation hormone is secreted in the fed state? Are vldl fasting or fed state? Which hormones are highly active during a fed state? What hormone is mre active during the fed state? How is glucose regulated in the fed and fast state? How are glucose levels controlled in the fed state? Which hormones and their affect during fed and fasted state.? What is the role of fed state metabolism? What hormone(s) dominate in the fed state vs the fasting state What is their role? How deos the FED state control glucose?